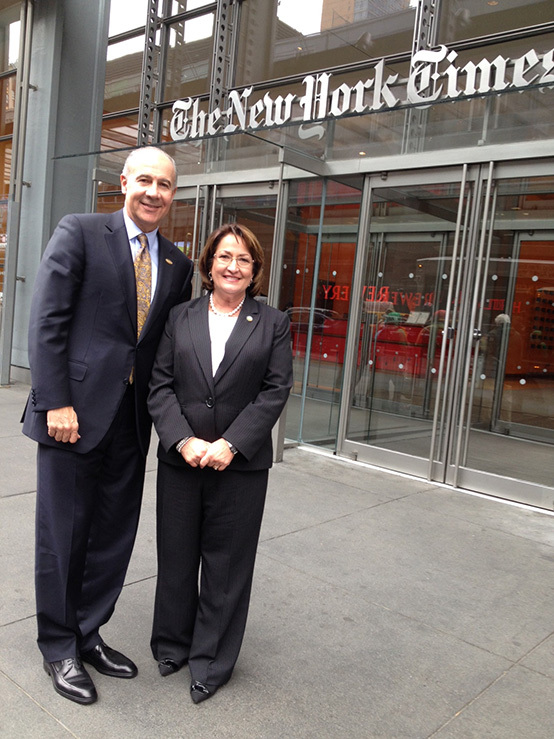 Orange County Mayor Teresa Jacobs and Visit Orlando President and CEO George Aguel visited the New York Times on Thursday to discuss the 62 million guests who visited the region in 2014. The announcement marks a new all-time record for the U.S. travel industry, solidifying Orlando’ position as the most visited destination in the nation. ORLANDO, FL (April 9, 2015) – Visit Orlando, the destination’s official tourism association, today announced that more than 62 million people visited Orlando in 2014. The announcement marks a new all-time record for the U.S. travel industry, solidifying Orlando’ position as the most visited destination in the nation. Visitation to Orlando grew 5 percent from 2013 as visitors from around the world came to experience all that is new across the ever-expanding destination. A record 32 million room nights were sold in Orlando in 2014, resulting in bed tax collections topping $200 million for the first time in Orange County, home to the Central Florida tourism district. In recent years, the Orlando experience has also become more diverse, attracting an increasingly wide range of visitors. Foodies find a surprisingly sophisticated culinary destination, recognized with more “Best of the South” chef nominations by the prestigious James Beard Foundation than any city in Florida for three straight years. Luxury travelers are drawn by five-star service at the Four Seasons Resort Orlando that opened six months ago, as well as the Ritz-Carlton Orlando and Waldorf Astoria Orlando. Visitors are also discovering exciting new venues in which to enjoy the arts and professional sports, like the Dr. Phillips Center for the Performing Arts and the Major League Soccer stadium coming to Downtown Orlando in 2016.